1,4 dioxane or 1,4 DD for short is an industrial chemical used in things like paint strippers, dyes, and varnishes. According to the Environmental Protection Agency, long term exposure to it could increase your risk for cancer, kidney damage, and a host of other problems. Last week, the Michigan Department of Environmental Quality announced that it would make a drastic change to the state standard for 1,4 DD. It plans to drop the level allowed in drinking water from 85 parts per billion to just 7.2 ppb. “It’s in part due to the change in the toxicity level assigned to 1,4 DD as well as the exposure assumptions,” said Bob Wagner, chief of remediation development for the DEQ. Basically he’s saying that 1,4 DD is much more toxic than we thought. Because of that, the DEQ had planned to change the drinking water standards for 1,4 dioxane, but this wasn’t going to take effect for a few years. However, this winter, when the City of Ann Arbor found that a similar dioxane plume was headed toward its drinking water supply—the DEQ fast-tracked the criteria for 1,4 DD. Now Wagner says the new rule will take effect this fall. Kalamazoo County also has a dioxane plume — and unlike Ann Arbor, it’s already in county drinking water wells. Rob Engels is a stay at home dad of two. He lives in Oshtemo Township—the northwest tip of where the 1,4 dioxane plume lies in the groundwater. Engels says he only found out about the plume a few years ago—and that scared him. “It was never disclosed to us at all that there was a problem with the water. And we never would have known that there was a problem with the water except for somebody showed up unannounced, without permission and was in my yard taking water out of my spigot,” he said. That was likely an engineer testing for the KL Avenue Group—the party responsible for the plume. The group includes the city of Kalamazoo, Kalamazoo County, Oshtemo Township, and Pfizer. The KLA has been running Kalamazoo city water lines out to residents like Engels since the ‘80s. At first, the group just told owner of specific homes that they couldn’t use their well water. The EPA decided that wasn’t safe enough. Most people near the plume needed to be on city water—even if their 1,4 DD levels were low. That's because the EPA says the plume is moving—slowly, but it’s moving. “The groundwater flow is not always completely predictable on our part and contamination flow is not always completely predictable. And so to protect against that unpredictability of where contamination might go, we include areas that are currently not identified as contaminated but could potentially be,” said Joan Tanaka, the EPA’s branch chief for remedial response programs in the Great Lakes states. The current groundwater restricted use zone in Oshtemo Township. The plume is moving west from the KL Avenue Landfill. The western-most boundary is off of West Main Street/M-43 at Wickford Drive. 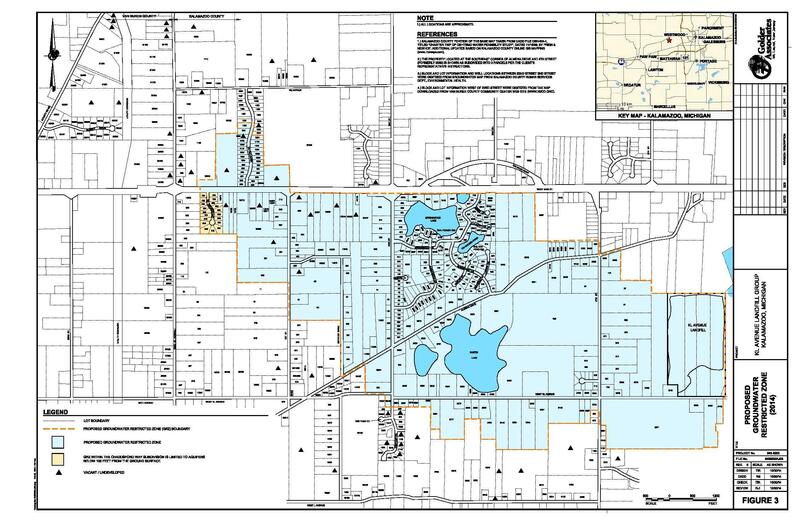 Last December Kalamazoo County approved a groundwater restricted zone in the contaminated area in Oshtemo Township. Almost everyone in the zone has switched to city water. The EPA says that the groundwater restricted zone will likely have to expand to include wells that are above the new limit. Dan DeWitt is the environmental attorney representing the group. He says the group will be testing about 100 wells in Kalamazoo County to make sure they fall under the new criteria. Engels’ home isn’t in the zone, but most of his neighbors’ are. With the 1,4 DD standard changing this fall, he could be soon. Under the new rule, Engels’ well would still be considered safe. He has just 2.8 ppb of 1,4 dioxane—lower than the new standard of 7.2 ppb. But since October, Engels says the levels at his home have more than doubled. The City of Kalamazoo has contacted him multiple times about hooking up to the city’s water. Engels, however, isn’t in a hurry to make the switch. Some of his neighbors have complained about how hard the city water is—that they’ve had to buy filters for their homes because the water clogs their appliances. Engels says he’ll happily hook up to the city’s water, but only if the KL Avenue Group agrees to pay for his water bills—as well as a water softener and filtration system. “I’m just asking those people to please—if they’re not going to allow me to drink the water that’s my right that runs under my house, they’re going to force me to pipe into Kalamazoo’s water—then they should at least do everything possible to bring my water up to the standard before they polluted it,” he said. Right now, the KL Avenue Group says it doesn’t intend to do that. Dan DeWitt says this is an old problem with an old landfill—many of the people responsible for the 1,4 dioxane aren’t alive anymore and can’t help pay these expenses. Aside from Pfizer, the other liable parties are the city of Kalamazoo, Kalamazoo County, and Oshtemo Township. Dewitt says they likely don’t have the money for it either. “The municipalities do have a role here and some liability, but then it comes down to do we raise taxes to pay for some people’s water bills going forward. And we just didn’t feel that was appropriate,” he said. Engels says he’s prepared to take legal action against the KL Avenue Group. DeWitt says so far The Upjohn Company—now under umbrella of Pfizer—has taken on the majority of the costs of the cleanup at KL Avenue Landfill. Residents near the plume are also receiving free hookups to Kalamazoo city water. DeWitt says parties in KL Avenue Group have not really discussed who would pay water bills—because the issue was never brought up. He says as of right now, all parties are equally liable for the KL Avenue Landfill. WSW: Should Flint Be The Catalyst For Removing All Lead Lines? Flint’s drinking water crisis has brought more attention to the issue of lead in drinking water. Mae Wu, an attorney for the Natural Resources Defense Council says a big national effort is needed to eliminate the risk. (MPRN-Lansing) A state House committee has OK’d an emergency spending measure to help Flint residents with a portion of their water bills.